Successful environmental management is partly contingent on the effective recognition and communication of environmental health risks to the public. Yet risk perceptions are known to differ between experts and laypeople; laypeople often exhibit higher perceptions of risk in comparison to experts, particularly when these risks are associated with radiation, nuclear power, or nuclear waste. 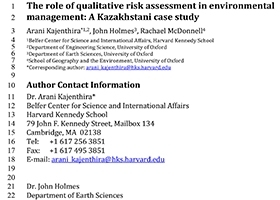 This paper consequently explores stakeholder risk perceptions associated with a mercury-­contaminated chloralkali production facility in Kazakhstan. Using field observations and in-depth interviews conducted in the vicinity of the Pavlodar Chemical Plant, this work assesses the relevance of the substantial on-­‐site mercury contamination to the health and livelihoods of the local population with the goal of informing remediation activity through a combination of quantitative and qualitative risk assessments. The findings of this research study cannot be broadly generalized to all the primary stakeholders of the site due to the small sample size; however, the indifference of the local population towards both the possibility of mercury-related health risks and the need for mitigation activity could pose a substantial barrier to successful site remediation and also suggests that a qualitative understanding of stakeholder risk perceptions could play an important role in striving towards sustainable, long-­‐term environmental risk management.